What classifies a classic car? It needn’t necessarily be Le Mans 24-hour or Monte Carlo Rally wins, beautiful (or brutal) styling, or contemporaneous class leadership. No, a classic just needs to be something interesting, to somebody, somewhere. How does an aluminium-bodied, wind-cheating, two-seater body, built alongside the NSX and S2000 in Honda’s Takanezawa plant in Japan, grab you? Interested? You should be, as the Insight was Honda’s leap into the future. Of course, it was unveiled in the past – way back, in 1999. In fact, the Insight goes even further back if you count the concepts that proceeded it, the first being the 1997 JV-X show car. Honda developed this into the 1999 VV concept, which introduced the production model shortly after. That showroom Insight still looks contemporary today, the lines a demonstration in efficiency, the form boasting some real beauty. Function dictates it, obviously, as the performance here is not what you might traditionally relate to a two-seat, lightweight coupé. No, efficiency is the Insight’s goal, and it does a remarkable job of this. That’s because underneath those graceful aluminium panels the Insight is a hybrid. It’s a term with which we’re all now relatively familiar, but that was revolutionary back at the turn of the century. It was Honda’s first production hybrid and, arguably, the first globally marketed hybrid, using technology that the firm dubbed Integrated Motor Assist (IMA). This combines a 68hp 1.0-litre 12v three-cylinder lean-burn VETC petrol engine with a brushless 10kW (13hp 49Nm) electric motor positioned on the crankshaft. The cumulative effect of both motors is 76hp and 113Nm. That torque output is usefully delivered as low as 1500rpm, although the numbers more usually associated with the Insight relate to the economy, the car having a combined consumption figure of 82.1mpg and CO2 emissions of 80g/km. Such figures would be remarkable today, but are even more so when you remember the Insight arrived almost two decades back. The batteries powering that electric motor, as well as the controls to operate it all, are positioned where the rear seats might more usually be, making this a strict two-seater. It’s arguably why the Insight didn’t fare so well against that icon of hybridisation, Toyota’s Prius, which although offered in Japan from 1997, wouldn’t be sold globally until 2000. Also, the Insight wore its unconventional powertrain more overtly than its four-door saloon rival, to the detriment of its overall appeal. The circa £17,000 list price didn’t do it many favours, either; the Insight was a not-inexpensive means of signalling your environmental concerns. That lack of convention is what interests enthusiasts today, as does how it drives. Really. Think ‘hybrid’, and you’re likely to conclude ‘earnest’ – and more often than not you’d be right. With the Insight that’s not the case. It’s enjoyable, whether or not you’re driving it as intended, with an eye on consumption. The three-cylinder engine is eager, the instant torque on offer thanks to the electrically assisted drivetrain gives brisk acceleration. It’s not heart stopping by any means – as is underlined by a 12.5-second 0-62mph time – but it is quick enough to be fun. Push it hard and that three-cylinder delivers a delightfully charismatic off-beat three-cylinder thrum. If anything, the IMA feels akin to an electrical turbocharger, giving boost to the 1.0-litre’s performance. Yet it never feels like it’s doing so for economy reasons, merely to aid motion. There is some regeneration – lifting off the accelerator sees the digital dashboard’s dial move from assist to regeneration – but even when accelerating the integration of the two motors works seamlessly. This in itself adds a layer of interest – even surprise – to the drive, this being the only hybrid I’ve ever piloted that’s been able to scavenge power back to the battery from the combustion engine while it’s driving gently up a hill. If you’re used to nursing along conventional old classics with an eye constantly on the dials for problems, then the Insight will appeal. Only here the dial watching is to understand what’s going on and how the powertrain is divvying up the task in hand. Being a Honda, you can be absolutely certain it won’t go wrong. It all operates so beautifully that you even forget this is a hybrid, and just enjoy it for being a light, engaging little coupé. While the engine is the main act, the rest of the Insight doesn’t disappoint. This one’s a manual – a CVT became available later – and its shift quality shares the same mechanical precision that’s core to any Honda’s appeal, whether it’s a lowly Jazz supermini, classic NSX or something wearing a Type R badge. 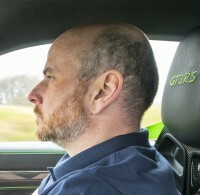 That alone makes the car enjoyable, but throw in accurate, nicely weighted steering and suspension that rides commendably – and grips decently given the high-pressure, low-rolling-resistance tyres it rides on – and it’s a surprisingly enjoyable car to drive. It’s quiet, too, being hushed at speed thanks to its aerodynamics and drivetrain. In short, the Insight demonstrates a breadth of talent that’s beyond its mere economy goals. The build quality feels impeccable, with narely a rattle or squeak inside, while the air-conditioning in conjunction with the heat-absorbing tinted windows is keeping out the warmth in the near-30 degree heat accompanying my test drive in Barcelona. Only the dashboard and slim pillars betray the Honda’s vintage; interiors have since gotten bigger thanks to crash-safety devices, and busier due to the development of technology that is hinted at inside the then-futuristic Insight. There’s nothing extraneous inside, as the Insight hails from the decade where the creep of modernity was apparent only in airbags and air-con. There’s no doubt, then, that the exotically constructed, defining-technology Insight classifies as a classic – and a properly interesting, engaging one at that. Should any further proof be needed, then the fact that Honda built only 17,020 of them makes the Insight relatively rare, while the company’s submission of around 300 patents for the car at launch only strengthens its case. That the manufacturer apparently built every single example at a loss cements things; in the rarefied world of the technology loss-leader, it shares this status with no less than the Bugatti Veyron. At its very core, then, this is a classic – and one that despite its somewhat worthy goals is genuinely worth getting excited about. Yesterday’s future, today; if any car signals a new wave of classics, then the Insight surely is it.